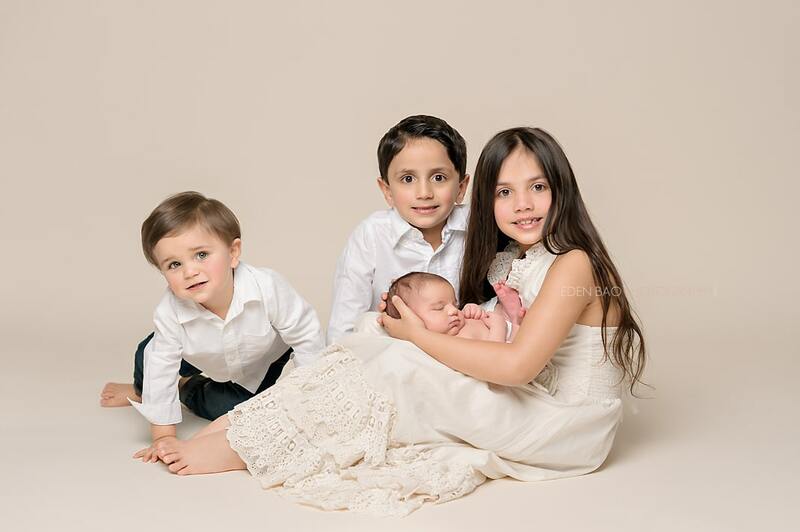 Thank you for allowing me the amazing and rewarding job of photographing your baby! I am truly honored to be able to capture this incredible time in your lives and look forward to getting to know you and your sweet baby! 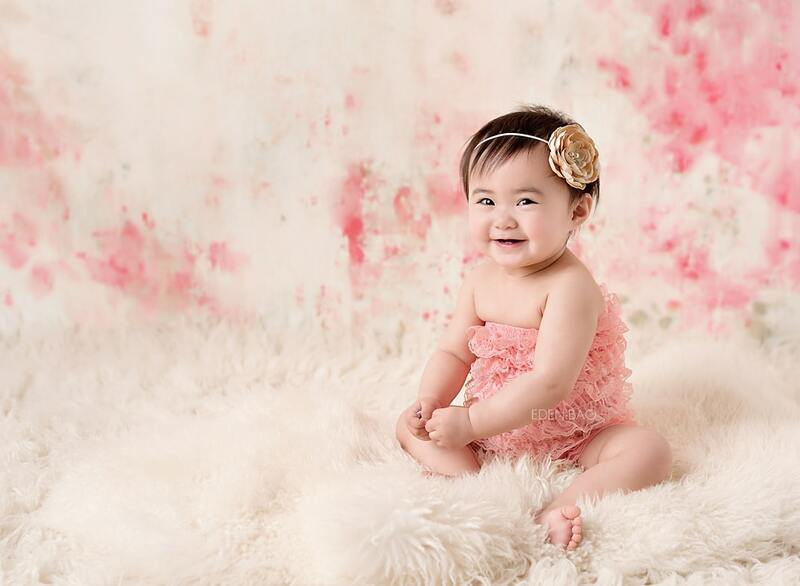 The tips found in this Baby Session Guide will help you prepare for your baby’s photoshoot. Clean, clean, clean – clean nails, clean hair and clean feet. Wipe away eye boogers and snotty noses. Brush baby’s teeth. Trim those tiny fingernails and toenails with baby trimmers. The cleaner the baby, the better their photos will turn out. Make sure your baby has napped and eaten before the shoot. It is perfectly okay to bring bribes to the photoshoot. Some crackers, snacks, or other candy that won’t stain their teeth can help a short photo shoot go by smoothly. Don’t let them eat or drink anything that will stain their face, teeth or mouths. Be patient. If your baby is fussy or alert, don’t stress out. Your baby can sense your anxiety and we want to keep the environment as mellow as possible. We will try to get them comfortable again, but if that doesn’t seem possible, we will take a break or we may reschedule (at the photographer’s discretion). Be prepared for messes of all kinds. Babies do not care where, when and who they pee, poo, spit up or vomit on. That is why I will be dressed in comfy clothes as I work and why you (if you want to be in the photos with your baby) would want to bring an extra set of clothes. As the session can take up to 2 hours, I can provide beverages (water, coffee or tea) and light snacks. For baby girls, you can’t go wrong with cute dresses, rompers, and dainty hats or headbands. For baby boys, jeans and polos or a button-up shirt, or a T-shirt (with no logos) can be very cute, as well as overalls on the right age and personality. Accessories are good too- little hats, suspenders, ties, etc. Mom: A subtle application of make-up can really soften your skin and accent your facial features. Natural looking fake lashes can flatter your eyes. Pluck and clean up those eyebrows. For wardrobe, long or 3/4-sleeve tops are very flattering. If you wear jewelry, aim for subtlety and be aware of its twisting and turning. A fresh coat of nail polish will make a world of a difference in your photoshoot. Pick a neutral color that won’t distract in your shoot or clash with your outfits. Dad: Be freshly shaved with a new razor, shaving cream and a moisturizing after-shave lotion to avoid bumps and redness. Trim up your beard, sideburns, moustache or goatee. Look especially for wiry stray hairs. Make sure your nails are clean and trimmed. Wear jeans or pants, tucked polo or dress shirt with a belt, or go causal with just a V-neck T-shirt or untucked polo, button-up short sleeves, etc. Sister(s): for wardrobe, wear cute dresses, rompers and headbands. Brother(s): Jeans and polos or a button-up shirt, or a T-shirt with a button-up over it can be very cute, as well as overalls. Siblings and baby don’t have to match perfectly, just coordinate. You can’t go wrong with light or dark monotones, which drive the attention in the photos to the sweet faces and darling expressions instead of loud prints or colours. A good tip is to pick a color that compliments your children’s eye color. Turning one is a major milestone, not only for your baby but for you as a parent too. You have made it through the first year of babyhood! This calls for a celebration with cake and balloon! For baby, celebrating in their birthday suit is the best and makes for easy clean-up after the session. If preferred, baby can wear an outfit too. 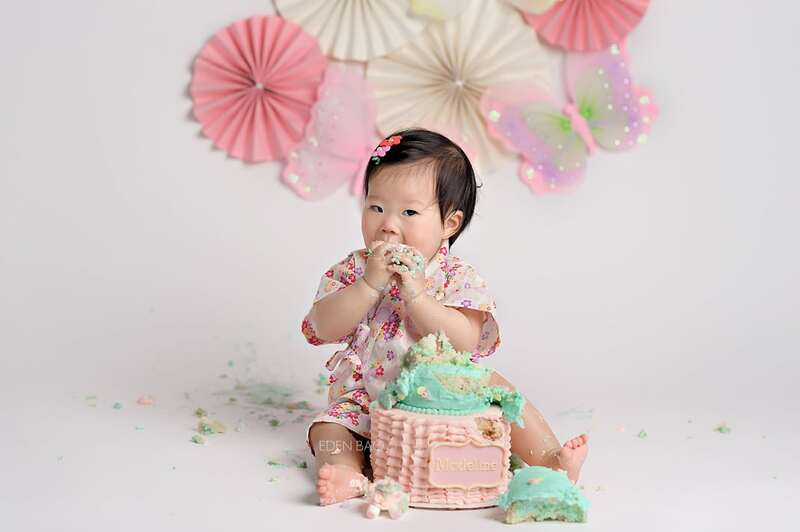 Due to (potential) allergies and potential liability, Eden Bao Photography will not provide the cake for your session. For customized smash cakes, please contact your baker well in advance to ensure your cake order is reserved. Choose a cake that is easily smashable and has vanilla or light-colored cake inside. Beware of bright and colorful icings that might stain teeth, clothing or the bathtub when you rinse your baby off. Note that cakes with red icing when smashed will look like a bloody massacre and chocolate will look like poo…unless that’s what you want to go for! It’s a good idea to make sure you test out a small cupcake or cake before your session. 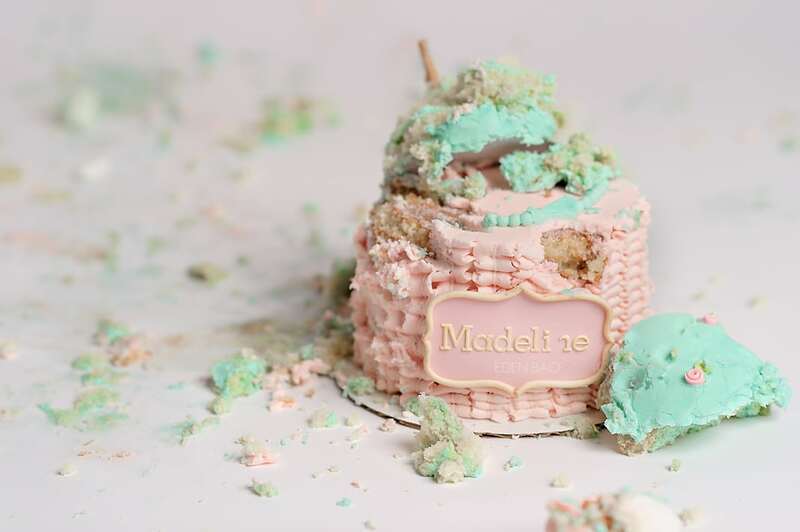 2) You want to make sure your baby has had a prior experience with cake smashing so that it is not overwhelming for them at the session and they know what to do! 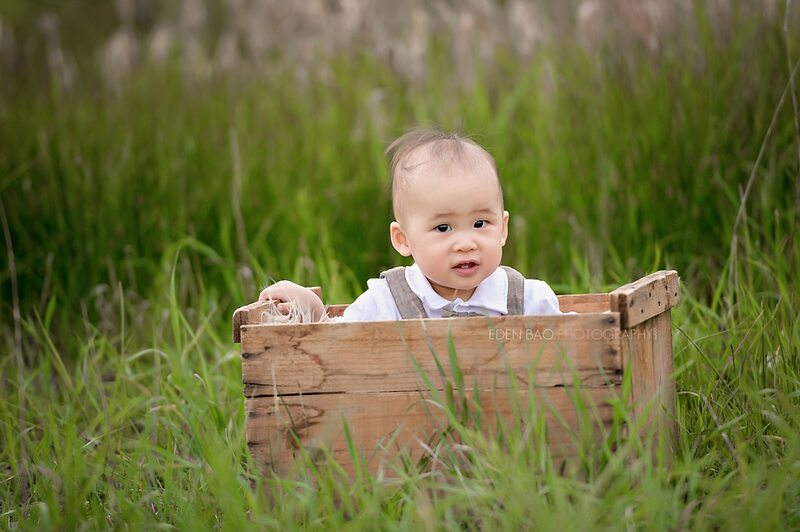 Preparation helps your session run smoothly so we can focus on capturing your baby’s personality! 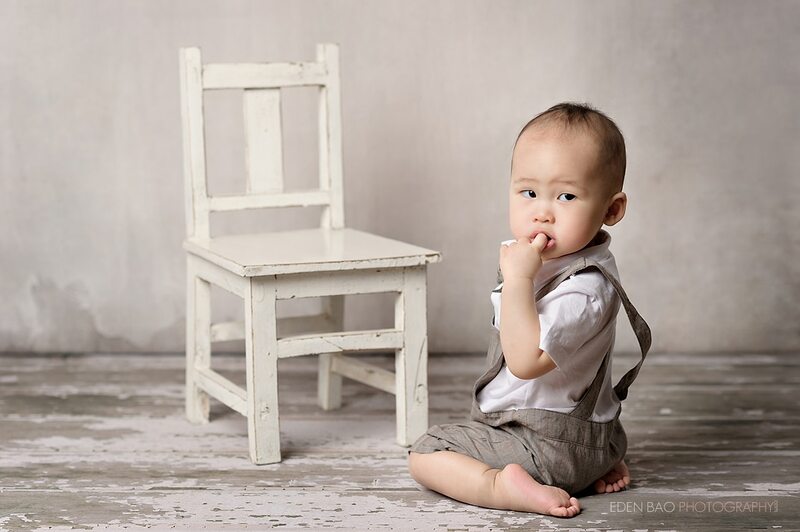 Eden Bao is a premier baby photographer based out of Bothell, WA. We serve Greater Seattle and the surrounding areas including Bothell WA, Mill Creek WA, Everett WA, Woodinville WA, Snohomish County WA, King County WA, Skagit County WA, Pierce County WA, Bellevue WA, Kirkland WA, Edmonds WA, Lynnwood WA, Snohomish WA, Marysville WA, Lake Stevens WA, Redmond WA, Issaquah WA, Shoreline WA, Green Lake WA, and Pacific North West. A proud member of Master Photographers International and Professional Photographers of America, Eden Bao Photography prides in capturing your portraits beautifully.